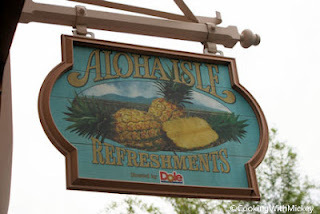 One must-make stop for Disney fans is Aloha Isle! The Dole Whip, possibly the most popular of all Disney snacks, is perfect on a hot summer Florida day. Also available is vanilla and orange soft-service ice cream, pineapple floats (also available are Coke and root beer), fresh pineapple, and a variety of drinks. 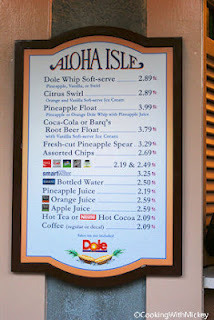 Menu Items: Dole Whip, citrus swirl, pineapple float, Coke or rootbeer float, fresh cut pineapple spear, assorted chips and drinks.